Air traffic controllers and airport security agents continued to work without pay — they will miss a second biweekly paycheck Jan. 25 — but high absentee rates raise the threat of long airport lines, or worse. 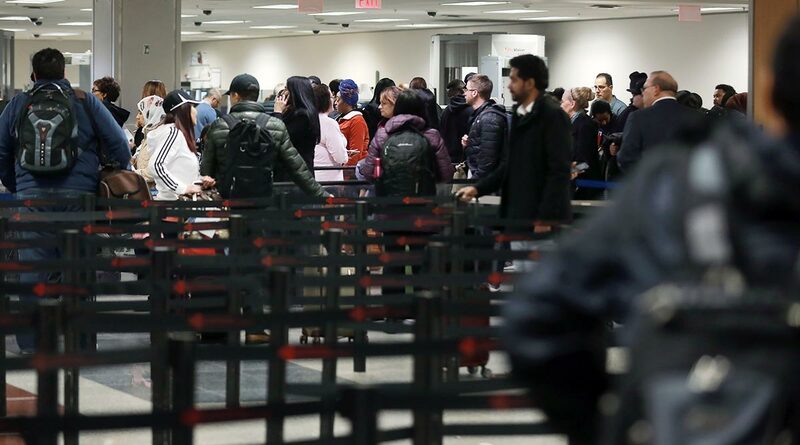 The Transportation Safety Administration said 7.5% of its airport security officers scheduled to work Jan. 23 did not show up. That is down from Sunday’s 10% absent rate but more than double the 3% rate of Jan. 23, 2018. TSA has resorted to sending backup officers to beef up staffing at more than 30 airports and at times, closing a couple of checkpoints at major airports. “We have seen no unusual increased absenteeism, and there are no operational disruptions due to staffing,” FAA spokesman Greg Martin said. He declined to provide figures. The impact to airlines’ business has been small so far. Southwest Airlines said Jan. 24 that the shutdown has cost it $10 million to $15 million in lost revenue. The airline had $5.7 billion revenue in the fourth quarter. Delta Air Lines, which had $10.7 billion in fourth-quarter revenue, expects to lose $25 million in sales this month. However, there are other effects. The shutdown is holding up Southwest’s plans to begin flights from California to Hawaii — the FAA regulators who must approve the long, over-water flights are not working during the shutdown. Delta’s service using new planes also is likely to be pushed back because FAA officials are off the job.